Counterfeit Nutribullets and other fake electricals are putting consumers in danger, according to a safety charity. Electrical Safety First carried out a test to see what would happen to a fake Nutribullet when a piece of ice or stone got stuck in the blades. In just over four seconds, the cheap rip-off overheated and exploded. Real Nutribullet blenders meet UK and European safety regulations. They passed the safety testing without any mishaps. 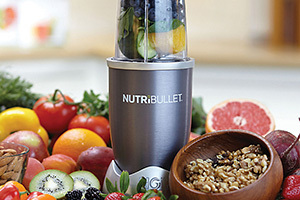 If you’re thinking of buying a Nutribullet or another bullet blender, take a look at our bullet blender reviews to find out which ones are best. You can watch what happened to the fake Nutribullet in this video of Electrical Safety First’s testing. Electrical Safety First says that the number of reported counterfeited electronics has grown by 12% in the past year. They also claim to have found fake Nutribullets, GhD hair straighteners and Apple accessories readily available for sale on popular online retailers. To avoid getting hoodwinked into buying a fake, the charity says to inspect products before buying (especially if they’re cheaper than you’d expect), read reviews, know where you are buying from, and beware of words such as ‘genuine’ and ‘authentic’ if they are used to sell a product. Fake Nutribullets aren’t the only possible source of unwanted pyrotechnics this Christmas. A spate of exploding ‘hoverboards’, also known as self-balancing scooters, has raised concerns over the safety of these items. Trading Standards officers working at ports and borders have examined 17,000 imported ‘hoverboards’ at national entry points and have detained 88% of them due to safety issues. Many of the boards have been found to have non-compliant plugs without fuses, which increases the risk of the device overheating, exploding or catching fire. Other problems include issues with the cabling, charger, battery or the cut-off switch within the boards, which often fails. To avoid these safety traps this Christmas, buy electronics from respected traders. Look for products with a CE mark, which means they meet European safety requirements. If you think you’ve bought a fake, take a look at our advice on reporting fake goods or counterfeit products. We answer the question: is a Nutribullet worth buying?